The week's almost over, what shall you wear? A shoe with a heel that's barely there, of course. Sam Edelman's "Nova" (available at shop.com) proves your shoes can be at a low altitude but still high on style. While many think a shoe such as this is better saved for evening soirées, we at S&B say you can easily wear them during the day, especially with ankle-length jeans or pants. 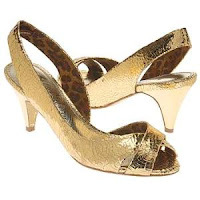 The peep toe and slingback make them fine for work (in less conservative environments), but the crackled gold finish and 2.75 inch heel say they're also perfect for play. Whether you're wearing these sandals to happy hour or the hottest nightspot, you have to order a drink with the "Midas touch". 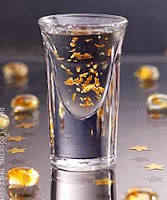 Start with a shot of Goldschlager at your favorite dive bar (don't want everyone to see you drink like a coed), if you dare. If you've never had it, it tastes like Red Hots on acid. Then, at the bar du jour, request a Goldfinger. A combination of Goldschlager, Grand Marnier and ginger ale, it's a sweet, spicy way to kick your summer fun into high gear. I have the Tar-jzay version of these shoes and they're HAWT like fiyah. Even HOTTER is that I got 'em ON SIZZALE for a smoooootthhhh $8.48.